The third season of Better Call Saul premieres Monday on AMC. And once again, I’ll have recaps breaking down every episode this season. But before the journey of Jimmy McGill becoming Saul Goodman resumes Monday, let’s take a look back at where we left all our key players at the end of season 2 and preview what we can expect this season. The last image of Season 2 was Chuck stopping a tape player that had just recorded his brother Jimmy confessing to forging documents (the same forged documents that cost Chuck and HHM the Mesa Verde account). The tape recorder with Jimmy’s confession at the end of season 2. Kim Wexler, Jimmy’s sort of business partner/love interest, benefited the most from Jimmy’s crime when Mesa Verde came back to her. The money from Mesa Verde (the bank Kim brought to HHM in the first place) is very important to both Kim and Jimmy, as Kim recently left HHM to enter into her own practice, sharing office space with Jimmy. Jimmy and Kim in their shared office in a Season 3 preview image. 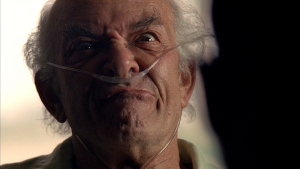 Meanwhile, Mike spent season 2 in a battle with Hector “Tio” (or as I like to call him “Ding Ding,”) Salamanca. After “Tio” threatened Mike’s family, Gus’s future enforcer purchased a sniper rifle and readied himself to take the drug kingpin out. But Nacho would not allow Mike a clean shot, keeping Tio alive and out of a wheel chair until at least season 3. When Mike returned to his car, he was greeted by a note simply saying “DON’T” on the windshield. The note left on Mike’s windshield at the end of Season 2 encouraging Mike to hold off killing Hector. How Much Trouble is Jimmy in? Most of AMC’s preview clips and photos hint that Jimmy has major legal issues in store for season 3. The only question is how much. And we know whatever those issues are, they won’t be enough to keep him in prison for long or get him disbarred. And what will Chuck’s reaction be to the unfolding legal drama? Jimmy’s brother showed last season just how sore a loser he can be. Will his brother getting away with forgery or coming away with a slap on the wrist push Chuck over the edge? How much time will Jimmy be spending in prison this season? The chicken selling/meth dealing entrepreneur who had a falling out with Walt in Breaking Bad is back for Season 3!!!! And like most people, I’m assuming Gus is the man responsible for the “DON’T” note on Mike’s car (though I also think Nacho is a strong candidate). So let’s hope season 3 brings us the birth of the Gus-Mike partnership. Here’s a training video for Gus’s company, Los Pollos Hermanos, recently released by AMC. How Close are We Getting to Saul? The first two seasons of “Saul” really slow played the conversion of Jimmy McGill to Saul Goodman. Though Jimmy pulled a questionable ethics violation here and there, he was mostly working for what could be considered the greater good. But will the legal maneuvering required of Jimmy in season 3 spring us forward to the money laundering, openly law breaking Saul Goodman? Or will Gilligan and his team continue the slow heel turn preferred in the previous two seasons? -Will Nacho’s side deals be revealed to his current employers? And if so, what will the fallout be? -Will this be the season “Tio” ends up in the wheelchair? -What other answers will we get from flashbacks this season? -Will we find out what happened to Rebecca (Chuck’s wife)? -When did Chuck become sensitive to electricity? -Will we ever meet the elder Hamlin? -And what’s in store for Gene (the new identity Saul took after Breaking Bad)? Will his story become its own separate drama to be followed? “Better Call Saul” comes on every Monday at 10 eastern/9 central. Then, be on the lookout every Tuesday for my recap of each episode this season.